PLATEADA Diameter: 27.25 mm Cup Diameter: 17.25 mm Rim Width: 5.00 mm Bore Size: 3.89 mm Back Bore: BarrelLarge symphonic: Easier to play and more flexible. 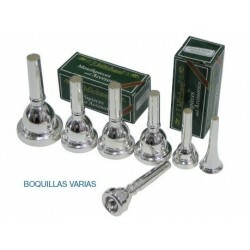 VIENTO METAL / BOQUILLAS / TROMPETA Boquilla para trompeta. Modelo 351 Bach 7C plateada.